Garlmer Personnel Biographies - Blanton, Jackson O.
Coastal circulation and dispersion, continental shelf dynamics with a focus on the physical oceanography of estuarine and shallow coastal waters and exchange processes between oceans and estuaries and the effect of these processes on larval transport. Blanton, J.O., C.A. Alexander, Merryl Alber and Gail Kineke. 1997. The mobilization and deposition of mud deposits in a coastal plain estuary. Hydrobiologia, In press. Blanton, J. O., J. Amft and T. Tisue. 1997. 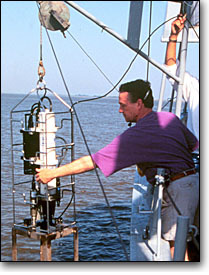 Response of a small-scale bottom-attached estuarine plume to wind and tidal dissipation. J. Coastal Res. 13: 349-362. Blanton, J. 1996. Reinforcement of gravitational circulation by wind. In: Buoyancy Effects on Coastal and Estuarine Dynamics, Coastal and Estuarine Studies Volume 53, D.G. Aubrey and C.T. Friedrichs (Eds), p. 47-58. American Geophysical Union. Washington, DC. Kapolnai, A., F. E. Werner, J. O. Blanton. 1996. Circulation, mixing and exchange processes in the vicinity of tidal inlets: a numerical study. J. Geophys. Res. 101: 14,253-14,268. Blanton, J., E. Wenner, F. Werner, and D. Knott. 1995N. Effects of wind-generated coastal currents on the transport of blue crab megalopae on a shallow continental shelf. Bull. Mar. Sci., 57(3): 739-752. Blanton, J.O., F. Werner, C. Kim, L. Atkinson, T. Lee and D. Savidge. 1994N. Transport and fate of low-density water in a coastal frontal zone. Cont. Shelf Res. 14: 401-427.